Next I chose to add some commodities exposure. Initially I went for exposure via a low cost ETC that gave exposure to energy, precious metals, industrial metals, livestock and agriculture via Futures contracts. In hindsight I think that what I did was a mistake and the reason you should always do your own research as I lost quite a lot of money here. Before anybody buys direct exposure to commodities I suggest you read about Contango / Backwardation , Counter-party risk. 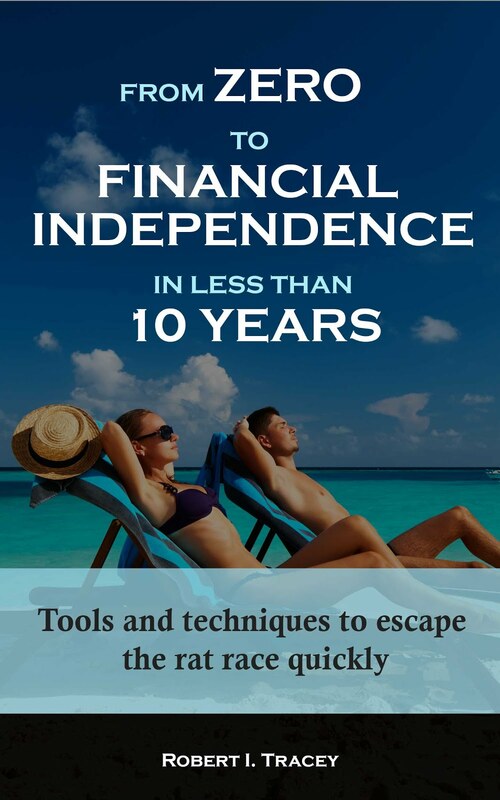 Additionally many ETC / ETF’s allow you to leverage your returns. Be sure to understand the affects of this also as they are typically rebalanced daily meaning performance will differ from what you expect. So what did I buy? In the end I settled on a simple vanilla ETF that buys physical gold and so tracks the gold spot price minus fees. Why gold? 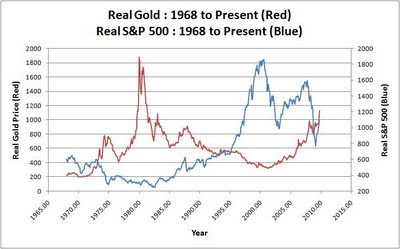 Using the Shiller dataset for the S&P 500 and the Austin Rare Coins dataset for Gold for the years 1968 to present day a relatively low correlation of 0.5 is achieved. What does 0.5 look like? Well rather than just show actual prices in history I present a chart showing real prices (ie after inflation) for both assets. 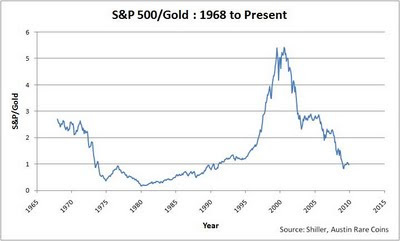 Additionally, it’s also worth looking at a chart showing the ratio of the S&P 500 to Gold (excluding inflation). So that’s my portfolio based on what I think are basically traditional asset allocation strategies. The final portfolio weightings however are where I try and introduce allocations that vary based on what I think is a sensible method for determining asset values at any point in time. This I’ll cover in Part 3. Very interesting Blog - good to see how you are building up your portfolio based upon a specific goal. Can I ask why you allocate so much to Australia (perhaps this warrants its own post?) e.g. compared to USA. I am interested in Australia myself - as a primary supplier of commodities to China etc and because it seems to be diverging from UK/USA economies (survived the recession better). Not sure I'd allocate 20% though. I allocate a significant amount to Australia as for me it's the very likely location to which I will retire (being when work becomes optional). 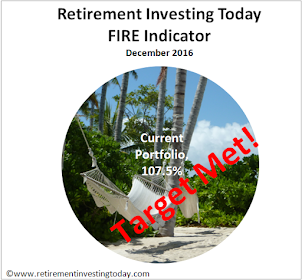 The traditional asset allocation models that I have run for myself suggest I hold significant exposure in the domestic market. I'm using the domestic market myself as both the UK (where I live and work now) and Australia (where I will live in the future) evenly split. With GBP's poor performance over recent times it's a strategy that has protected me well so far meaning that I could still leave the UK today (even if not to Australia) and be ok when considering exchange rates. I am also holding as a partial commodity play knowing as you mention that Australia is a significant commodity supplier to China.